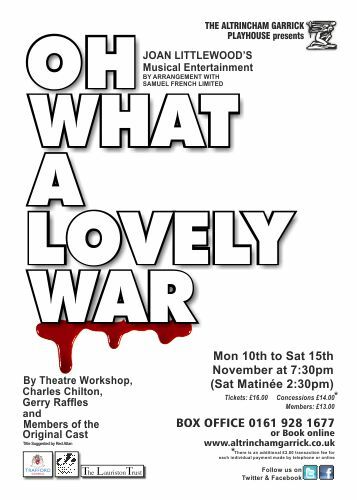 The first review of last night’s opening performance of ‘Oh What A Lovely War’ has just been published from the Messenger. You can read that review, plus all the photos at our website HERE?together with any future reviews and comments. For those that were in the audience (an almost FULL HOUSE), ?it was a memorable production – a tribute to all the hard work and effort put in by all departments at the Garrick – a team effort! But even more important, a fitting reminder of the events of the First World War, 100 years ago. and our traditional festive panto – ‘Jack and the Beanstalk’ ?is also 75% FULL, for the entire run! Once again it’s a very busy season for the Garrick ?Playhouse, with audiences booking well in advance to secure their seats.